Recently, a second supermassive black hole with a compact radio jet has been surprisingly found by radio astronomers from China and Europe in the outskirts of the nearby giant spiral galaxy NGC 5252. It is believed that every galaxy hosts a supermassive black hole, which is at least million times massive than the Sun, in its nucleus. Since there are many galaxy clusters and interacting galaxies in the Universe, galaxies with two or more supermassive black holes should be ubiquitous as well. However, it is difficult to find pairs of supermassive black holes that actively accrete mass and have a separation of less than the size of their host galaxies (about the distance between the Sun and the centre of the Milky Way). Pairs of active galactic nuclei are quite interesting because they may provide clues on the formation and the growth of giant galaxies and monster black holes. NGC 5252 is about 320 million light years away from the Milky Way. At the centre, it has an active galactic nucleus with a supermassive black hole, recognized by its optical, radio and X-ray properties. A second very luminous X-ray source, catalogued as CXO J133815.6+043255, was found in the outskirts of NGC 5252 last year. This powerful X-ray source appears quite compact in the optical and radio images, similar to the supermassive black hole in the nucleus. 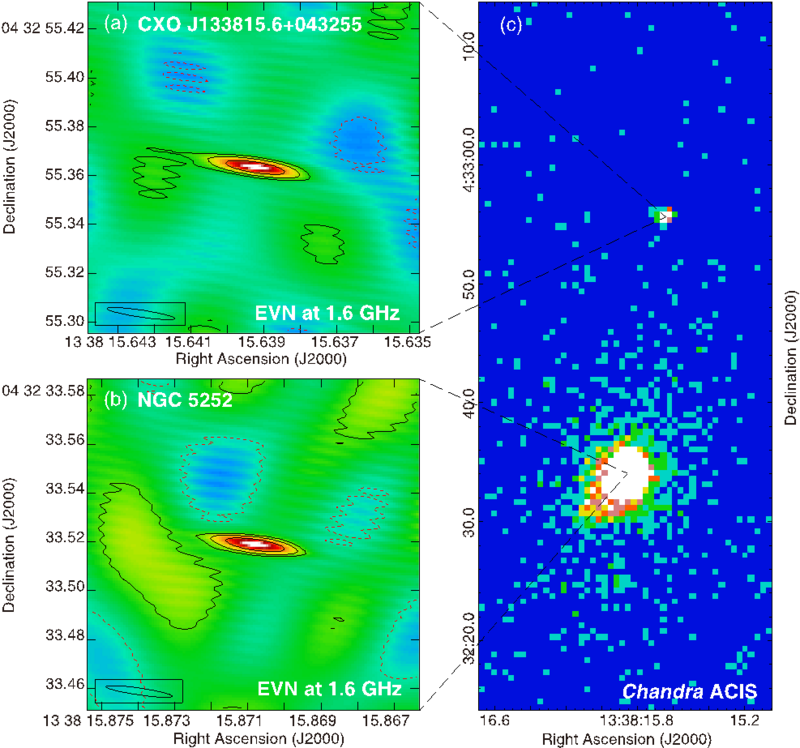 To uncover its mysterious nature, an international team led by Dr Jun YANG from Onsala Space Observatory of Sweden, has made the highest resolution image of its radio counterpart with the observational technique of very long baseline interferometry (VLBI) provided by the European VLBI Network. “No doubt –– it has a compact radio jet in the image with a high resolution of a few milli-arcseconds.” says Xiaolong YANG, a PhD student supervised by Dr Xiang LIU from Xinjiang Astronomical Observatory of China. “Most likely, the jet is associated with a supermassive black hole.” adds Dr Xiang LIU. “This is one of the few unique dual radio-emitting supermassive black holes as far as their small separation is concerned”, comments Dr Tao AN, a radio astronomer in Shanghai Astronomical Observatory of China. It is not clear whether the two black holes in NGC 5252 will finally merge or not. However, finding more supermassive black hole pairs will definitely enable astronomers to run statistical studies of their final fate. VLBI Network (left) in the radio band and Chandra (right) in the X-ray band.